I discovered Todd Parr’s books at Winners when I was browsing the store for a bench for my parents’ entrance. Each time I am at Winners, I go to the children’s section to see if there is anything interesting there. Winners always has educational and fun toys and books that are usually at an affordable price. I don’t always buy, but I like to browse. A beautifully illustrated and colored book grabbed my attention. I read it on the spot and I loved it. It was not my intention to buy a book, but I bought it. I brought it home and kept it to gift it to my children for their birthday in June (they celebrate it together as they are both born in June). At home I googled Todd Parr, the author’s name, and I spent quite some time on his website. Todd’s website is a world of color, fun, and endless possibilities. Like his book, it incites children to create, to be themselves, and to be better. It helps kids grow inside and become accomplished and self-sufficient adults. On Todd’s site, one can print coloring pages (and other activities) from his books, step-by-step instructions on how to draw Todd, as well as instructions on how a child can create their own book. Todd offers some ideas on how the child can get started on creating their own book and from there they can use their own imagination. I put on hold Todd’s books (but not “The Thankful Book”) at our local library and when I brought them home, my children shared my enthusiasm. We love Otto, the cute little dog, and we love the stories that teach us about the world, about friendship, about caring and being kind to ourselves, to people around us and to the Planet. All the books are colorful, funny, and engaging. The ideas in each book are easy for children to understand and relate to. The books have simple ideas with powerful and meaningful messages. Todd’s books make us feel good about the world and hopeful for the future. They give us hope that each of us can have a positive impact on people around us and on the environment. Todd encourages children through his books to accept themselves the way they are and he boosts their self-esteem in the process. Todd’s books helped me initiate conversations with my son that I might not have talked/brought up about otherwise. We talked about how we all make mistakes, learn from them, we talked about how all people are different, but deep down we are the same, and about many others topics that Todd’s books helped us start. Since Todd’s books were such a hit with my children (and my husband and I), I decided to contact Todd Parr to find out if he would agree to an interview and a giveaway with 3 of his books. He gladly (and quickly) agreed. 1. How did your passion for writing ignite? Thru my art! I loved art in school, but was lacking in confidence. I came back around to it again in my 20’s and 30’s and I was painting large canvases with messages on them. 2. Several of your books reached the New York Times bestseller list. However, you mentioned on your site that you failed art class. What made you keep going and not give up? Were there lots of bumps and turns on the road? I did give up on my art. It was not until I got out in the world that I gained enough confidence to realize I could do this. There were LOTS of bumps and turns in the road. 3. Why children’s books? What sparked the idea of writing children’s books? There was never a question as to who to write for. My art style and colors spoke directly to children. 4. How do you decide on which idea to use when you write a book? How does the creative process begin and proceed for you? I have a long list 🙂 Some ideas are from my childhood and a lot come today from seeing how my books are used and hearing suggestions from my editor, teachers, parents, etc. The process usually begins with a topic, tentative title and then right into the art. 5. Otto, a cute dog, makes a frequent appearance in your books. Is he based on a real-life dog? Do you own any dogs? Otto was based on my dog Bully. He is no longer here, but I have three others: Pete, Tater Tot, and Jerry. 6. Tell us a bit about your preschool show “Todd’s world” that premiered on TLC and Discovery Kids? Is the show still running? If not, are you planning new shows? The show is no longer running, but did continue for a numbers of years in other countries after it stopped airing in the US. I am working on a new show with WGBH in Boston as the production partner. 7. Your books were published in 14 languages. Are you planning on extending your reach further in the near future? I think I am up to 18 different languages now and it’s so great to see how my message translates around the world. Not every country is onboard with my style yet, but I do hope to reach so many more people around the world, as well as more of my titles translated into Spanish for the US and Canada. 8. Are you currently planning or writing a new book? If yes, could you tell us what is it going to be about? I have a new book out later this year titled “The Goodbye Book” and it’s all about how hard it is to say goodbye to someone. I am just finishing up a book for next year that is all about celebrating teachers and going to school. And since I did “The Mommy Book”, “The Daddy Book”, “The Grandma Book”, and “The Grandpa Book” I, of course, had to do “The Brother Book” and “The Sister Book”. 9. You are visiting Sherwood Park, Alberta in April to talk to children and their families. Would you ever consider visiting one of the libraries in Calgary? I would! I love Canada! 10. Last question. Because I enjoy eating delicious and nutritious food and I love making it for my family and friends, I have to ask you a food-related question. Which foods did you like eating when you were growing up and which foods do you like to eat now? My favorite thing growing up was macaroni and cheese with worms, tacos and tater tots. My favorite food today is macaroni and cheese with worms, tacos and tater tots. Oh, I also like blueberries, peas, and spinach. Before I tell you about the 3 books that are included in the giveaway, I would like to share with you a handy checklist for back to school that I found on Todd’s site. Although we are still in the middle of the school year, I printed this fun checklist and taped it on my son’s bedroom door (he is in kindergarten). He loves reading this checklist and it makes him giggle. 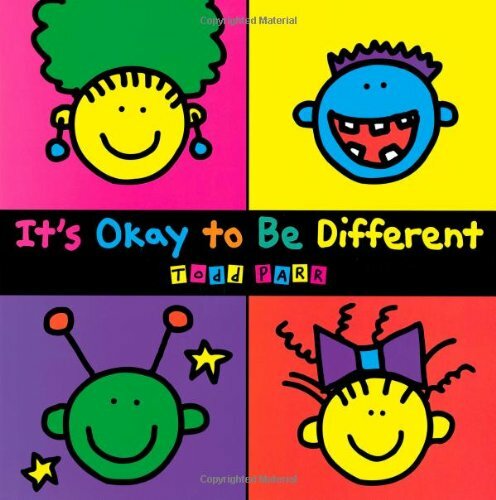 It’s Okay to be Different – Todd Parr encourages us to accept ourselves and others. Even if we are different from others in many ways, that is not a problem, it is actually okay. It’s Okay to Make Mistakes – In this book Todd teaches us that no matter how many and what mistakes we make, it is okay to make them as we learn from them. 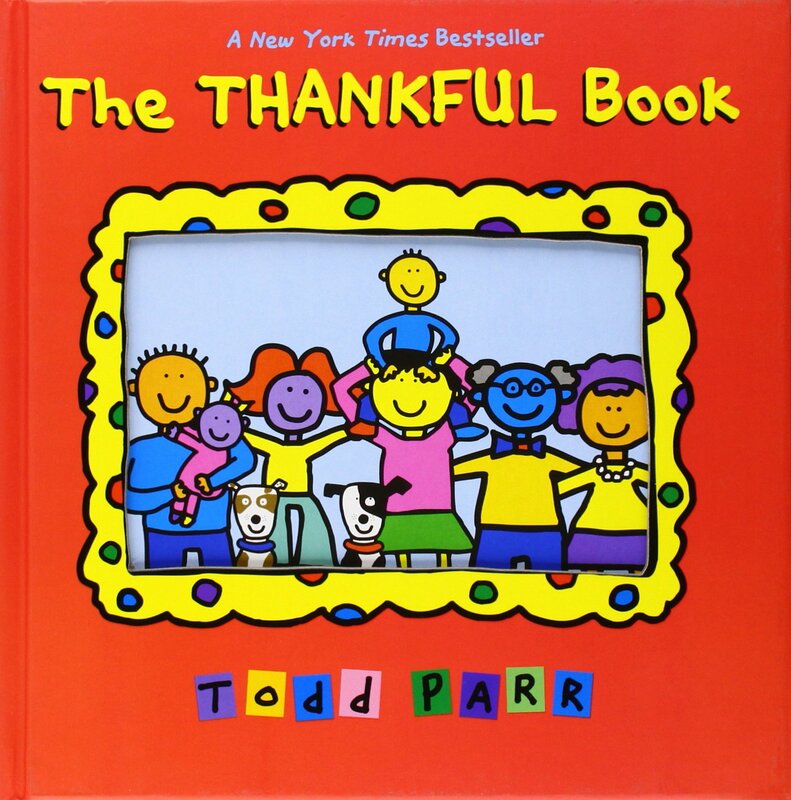 The Thankful Book – The book encourages us to appreciate and be thankful for what we have. I hope you will love Todd’s books as much as my family and I do and that you will read and enjoy them with your child. If you would like to win Todd’s 3 children books, please let me know in the comments section what is your child’s favorite food and subscribe to Orgali updates by email. The link to subscribe (green rectangle) is on the right side of the Blog page. This giveaway is open to readers residing in Canada (except the province of Quebec). Skill testing question required. No purchase necessary. The giveaway closes on Friday, April the 17th at 8:00 pm Mountain time. A winner will be chosen using a random number generator and announced on the blog on Friday, April the 17th. I will contact the winner by email once I post the result. The winner is Patricia Sampson. Congratulations, Patricia! I just sent you an email. My child’s favorite food is definitely Kraft Dinner…..
My 2 1/2 year old son is such a fussy eater. I have trouble getting him to eat anything with more texture than a puree. My husband and I aren’t pushing the issue because if you give him something he doesn’t like the taste or texture of, he will gag until he vomits. He’s healthy and gaining weight so we leave it be. We continue to offer whole foods and foods with texture. One day, he will just surprise us and take a bite. His favourite food would have to be custard. My 4 year old’s favorite food is yogurt. That boy would eat it all day, every day if I let him. 🙂 Thanks for an awesome giveaway! My 10 month old likes pretty much anything that we give her! This week her favorite is rice pasta with tomato sauce and chicken meat balls. Thank you for hosting this great giveaway! The Thankful Book looks cute! My son is only three months old, so his favourite food is formula. I would love to build up his reading library with quality books that teach great lessons. The apple doesn’t fall far from the tree, my daughter’s favorite food is pizza. One of my kids favorite food is Kraft Dinner. My kids love hot dogs with mac n cheese! Not the healthiest, but they love it! These books would be for my grandson who is only 4 months old so no solid foods yet. Gramma is hoping that the homemade applesauce that I am planning on making him will become a favorite food.! I am an email subscriber. My children are picky eaters especially my “sensory” child who is 6. Currently he will only eat chicken breast as long as its not at all discoloured (has to be totally white) with zero seasoning (and it has to be shredded), bacon, banana (as long as there are no bruises or discolouration), cheddar cheese, vanilla ice cream, and bell peppers (but the peppers have to be cut in rings). He will also sometimes eat corn, peas and string beans and of course will eat things like chips, cookies, and he drinks a lot of milk. Oh, and he likes chocolate pudding cups for school. Thanks for the chance. One of my little guys loves bread and the other loves berries of all kinds. One of my girls loves macaroni and cheese and the other loves tacos. All four of them would appreciate these beautiful books! My grandson just loves books. He gets that from his mom and grandma. Not sure he has a favourite yet, but he just can’t get enough of them. I absolutely love everything about these books and would be thrilled to give them to my grandson. Cheese, crackers, chicken and apples seem to be favourites (and easy!!) subscribed too! My toddler loves pizza,quesidillas, and grilled cheese. He loves all 3 so much that , that is almost all he eats . chicken nuggets is her favorite food. The kids love Kraft dinner!! My kids fav is kraft dinner! Favourite food is bread. Squished soft bread. At 4 months, he really loves breastmilk!